Target 1 “Blue-Eyes” monster you control; this turn, that face-up monster is unaffected by card effects, except its own, it cannot be destroyed by battle, also any opponent’s monster it battles is destroyed at the end of the Damage Step. While this card is in your GY, if you Normal or Special Summon a “Blue-Eyes White Dragon”: You can Set this card, but banish it when it leaves the field. You can only use this effect of “The Ultimate Creature of Destruction” once per turn. The Ultimate Creature of Destruction is Blue-Eyes support that any archetype wishes it had. A trap that makes a Blue-Eyes monster invincible for the turn, destroys any monster the targeted monster battles with, that is god-mode power. If that wasn’t enough, if you summon a Blue-Eyes White Dragon you can reset this card from your grave just like how Lost Wind can pull itself back from the grave. Doesn’t matter that it gets banished after that, you’ll be running three of this in the deck. Trip this card to protect your monster and at the very least break even with an opponents attacking monster. The protection this card offers is unheard of for a card, and to have a wide-reaching arc for its power. It may not protect monsters with “Eyes of Blue”, but it will protect all your heavy-hitting boss dragons that share the Blue-Eyes name. This is what Eternal Soul was to the Dark Magician archetype, but instead of repeated Special Summoning ability, you get protection from all for a turn and guaranteed destruction of an opponents monster. Even more Blue-Eyes support this month, this time with The Ultimate Creature of Destruction, which oddly isn’t a monster. The Ultimate Creature of Destruction is a Trap Card that when activated lets you target a Blue-Eyes monster you control and this turn it is unaffected by card effects and cannot be destroyed in battle as well as any monster that battles the Blue-Eyes monster is destroyed at the end of the Damage Step. 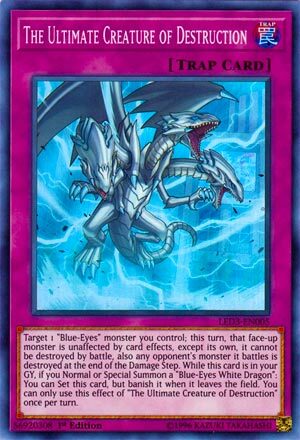 Nice to give any Blue-Eyes monster this protection, sadly Azure-Eyes Silver Dragon isn’t a Blue-Eyes monster technically since the name doesn’t have Blue-Eyes in it, but Blue-Eyes Spirit Dragon would love this protection if you aren’t ready to tribute it. While this card is in the GY, if you Summon a Blue-Eyes White Dragon (Blue-Eyes Alternative should trigger this since it is Blue-Eyes White Dragon on the field) you can set this card from the GY, but banish it when it leaves the field and this is a hard once per turn effect. Nice that this card recovers itself to use again, get as much value out of it as possible. The Ultimate Creature of Destruction can be a useful card for Blue-Eyes and is worth throwing a copy of it into your Blue-Eyes deck since Bingo Machine, Go!!! can potentially search this, but it isn’t that good where it feels like running multiples is required. Art: 4/5 Sadly, Blue-Eyes Ultimate Dragon isn’t as much of an Ultimate Creature of Destruction as it used to be, still looks cool. The Ultimate Creature of Destruction is an interesting little Trap, and more welcome support to the Blue Eyes theme. This is a Normal Trap, that lets you target any Blue Eyes Monster you control. For the turn this card is activated, that Monster is immune to effects (aside from its own), can’t be destroyed by Battle, and destroys any opponent’s Monster it Battles with. This card would be searchable with Bingo Machine Go (which we looked at last week) so that can be helpful if you REALLY need something like this to help you for a push to win, or maybe even just to help you out of a bind. This card can also cycle itself from the Graveyard, letting you Set it back to the Field, when you Normal or Special Summon a Blue Eyes White Dragon. If brought back to the Field in that manner, it is removed from play when it leaves the Field. Which isn’t a huge loss, if you do get to use this twice. It’s good to recycle things as a general rule when/if you can, though your opponent will obviously know it’s back on the Field, and if it gave them a fit the first time, they’re likely going to be able to counter this the second time. (Losing the surprise aspect of a Trap can hurt). Not a bad card, just not quite enough, in my opinion. Art: 4/5 BEUD doing his thing, the weather/destruction in this picture is cool enough I guess, but you’d think that the damage or destruction caused by BEUD would result in a more destructive picture. The Ultimate Creature of Destruction is a Normal Trap Card that grants a targeted Blue-Eyes monster of yours immunity from card effects and battle destruction. Whatever it battles is destroyed regardless of Atk points. If it’s in your grave, you can reset it to the field after you Normal or Special Summon BEWD (or Alternative), but then it gets banished when it leaves the field. These awesome protections last the turn The Ultimate Creature of Destruction is activated. The reset is only once per turn, but this searchable Trap Card is free and worth discarding for a cost to something else knowing that it will be reset later. Running 2 would be worth it to give Normal BEWD “effects” and to see that awesome artwork.